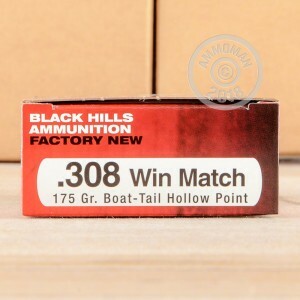 This .308 Winchester ammunition from Black Hills Ammunition is one of the most accurate loads on the market and will serve you well in competition. These cartridges come in boxes of 20 and fire a 175 grain match grade hollow point at a muzzle velocity of 2,600 feet per second. Thanks to their boat tailed profile and heavy weight, these projectiles retain excellent accuracy even at long ranges. 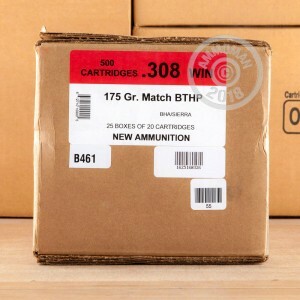 Black Hills ammunition is widely used by firearm manufacturers for weapon testing and also sees specialty use with all branches of the US military. It uses non-corrosive Boxer primers and brass cases. 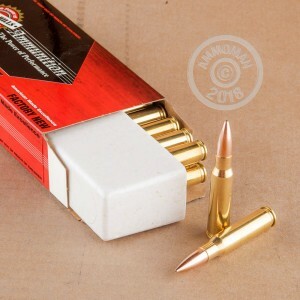 Match grade ammo is never cheap, but AmmoMan.com can certainly help you cut your costs even for the good stuff. Simply place an order for $99 or more and we ship it for free!